Absco Premier Garden Sheds represent a high quality Australian made range of sheds. Doors are hinged for added security. This model comes with a stylish gable roof. A very popular shed as it comfortably fits into most suburban backyards and has a very attractive price tag. This shed is engineered to withstand winds of up to the wind rating N2 (147km/h). Additional cyclone kits can be purchased to increase the wind rating to W50 which can withstand winds of up to 180km/hr. These sheds are DIY and come flat packed with everything you need including a manual. You will need some tools and we recommend watching some of our videos before building. For permanent and secure installation it is recommended to use concrete anchor sets. To anchor your shed to your concrete slab you will need 12 anchors for this size. 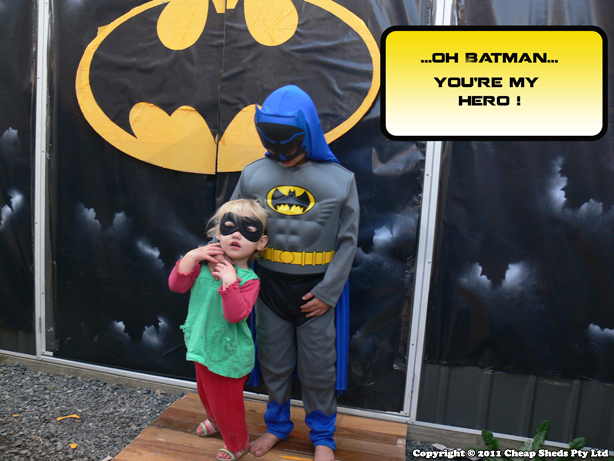 My son Luke was begging me for a Bat-Cave so I thought about digging a big hole under our house, but then I remembered Cheap Sheds and figured he could have a Bat-Shed for a few years then we could covert it into a more regular shed when his bat days are over. He loves playing in it with his little sister Asha (AKA robin), and they are forever rounding up the neighbours kids as prisoners! The shed is awesome, we all had fun making the concrete base and it was really easy to put together. I’m not sure when I’ll get my shed back, but I realise I might have to buy another one to make my own “Man-Cave”. Hi, I am interested in a shed 3 x 1.5 however I wish to have the door on the 1.5m side is this possible? I am interested in buying this shed but would like sliding door instead of swinging doors. Is this possible?